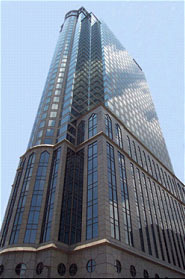 (Tampa, Florida) – Located downtown, the 100 North Tampa building is a prominent piece of architecture in the city’s skyline. It is the tallest building in Tampa with 42 stories and 552,000 square feet of rentable space. Noted for its classic architecture, the tower also features distinctive interior details, including two murals by noted artist Richard Haas. Amenities include in-building parking, a concierge, dry cleaners, sundry shop, auto detail center, YMCA, conference center and an AmSouth Bank Branch. The $108 million dollar construction project was completed in July of 1992 only to incur higher than expected energy costs. Management looked to local KMC partner, Automated Building Controls Systems Inc. (ABC), to upgrade and integrate a computerized control system. ABC designed and installed the requested system using KMC WinControl® software and numerous programmable controllers. These controls monitor and respond to outside climate changes, and maintain consistently comfortable temperatures throughout the building. WinControl integrates the different HVAC units into one common user interface, and allows for full HVAC control from a central computer. The program includes trend logging, system history, current events, timing capabilities, and alarm features. The installed KMC products also “left the door open” for future systems integration. The building has twelve high-speed, computer-controlled elevators serving the office floors, as well as three equally sophisticated elevators linking the garage levels to the main lobby. These elevators, along with the time controlled lighting system, are integrated into the KMC program. The redesigned project was completed in November of 1995, and has been working effectively ever since. The controls system has undoubtedly paid for itself many times over. Still, there is ample indication that it will continue to add value to this most prominent building of Tampa’s skyline for many years to come.